LANSING — With the Nov. 8 election two months away, money is already flowing in the battle for control of the Michigan House. Two races have passed the $200,000 fundraising mark, and many more will in the next weeks. With no gubernatorial race or competitive State Senate races on the ballot this fall, the 110 State House races will be the big draw. Democrats need to flip nine seats to take control of the House while Republicans will be looking to protect their 63-45 majority (two Democratic-leaning seats are currently vacant*). The 2014 battle for control of the House was the most expensive in Michigan’s history with a price tag of $25.3 million. Three individual races in 2014 exceeded $1 million. It’s likely that the 2016 version will get close to or will surpass the $25.3 million record. Below is a look at the competitive House races drawing the most money so far and where it’s coming from. Campaign finance disclosures covering up to Aug. 22 were due on Sept 1. MCFN will update this ranking periodically in the weeks leading up to Nov. 8. All fundraising dollars reported here have been raised by the candidates’ own campaign committees. Historical records show that spending by the legislative caucuses, interest groups’ Super PACs, the political parties and nonprofit corporations frequently outpace the candidates’ spending in the general election. Much of that spending will come closer to the Nov. 8 election. A rematch between Rep. Holly Hughes (R-Montague) and former Rep. Collene Lamonte is attracting the most money of any competitive House seat so far. That’s mostly because both candidates have been very successful fundraisers. Hughes, who unseated Lamonte in 2014, has raised $181,862. Lamonte, who unseated Hughes in 2012, has raised $143,385. Hughes’ top contributors have been Hughes herself ($10,000), the DeVos family ($9,000) and Speaker Pro Tem Tom Leonard’s PAC, Michigan Values Leadership ($5,900). Lamonte’s top contributors have been the Service Employees International Union Healthcare PAC ($10,000), the Operating Engineers Local 324 PAC ($10,000) and the West Michigan Plumbers, Fitters and Service Trades Local Union 174 PAC ($10,000). The Oakland County-based 39th District is in second place mostly because incumbent Rep. Klint Kesto (R-Commerce Twp.) has fundraised $176,310 so far this cycle. His Democratic challenger in this potential background is Wolverine Lake Councilman Michael Stack. Stack has raised $27,573. Kesto’s top contributors have been the DeVos family ($9,000), the Michigan Beer & Wine Wholesalers Association PAC ($3,500) and the Blue Cross Blue Shield of Michigan PAC ($2,500). Stack’s top contributors have been the Michigan Regional Council of Carpenters PAC ($5,000) and the United Auto Workers Voluntary PAC ($2,500). Calhoun County Commissioner Jim Haadsma, a Democrat, is hoping to unseat first-term Rep. John Bizon (R-Battle Creek), and Haadsma is keeping pace with Bizon in fundraising. Haadsma has raised $77,344 while Bizon has raised $108,695. Haadsma has received maximum contributions from two PACs: the Michigan Association for Justice ($10,000); and the Michigan Laborers Political League ($10,000). The Michigan Regional Council of Carpenters PAC has also given $5,000. Bizon’s top contributors have been the Michigan Osteopathic PAC ($10,000) and the DeVos family ($9,000). Speaker Pro Tem Tom Leonard’s Michigan Values Leadership PAC and Rep. Mike Callton’s Callton Action Fund have each contributed $5,000. Steve Marino, a GOP Macomb County commissioner, has given himself $50,100 so far this cycle and has helped put the open 24th District on this list. Marino has raised $109,720 total. Former Macomb County Commissioner Dana Camphous Peterson, the Democratic candidate, has raised $75,336. Marino’s other top contributors have been the DeVos family ($9,000), Speaker Pro Tem Tom Leonard’s Michigan Values Leadership PAC ($7,500), the Business Leaders for Michigan PAC ($5,000) and Rep. Rob VerHeulen’s VerHeulen Leadership Fund ($5,000). Camphous Peterson’s top contributors have been the Michigan Regional Council of Carpenters PAC ($5,000), the United Auto Workers Voluntary PAC ($5,000) and Emily’s List ($4,000). In the 71st, Rep. Tom Barrett (R-Potterville) is in a rematch with former Rep. Theresa Abed (D-Grand Ledge). In 2014, the two candidates were in the third most expensive House race that cycle. Barrett unseated Abed by 148 votes. Barrett has raised $129,779 so far this cycle. Abed has raised $50,350. Barrett’s top contributors have been the Michigan Chamber of Commerce PAC ($10,000), Speaker Pro Tem Tom Leonard’s Michigan Values Leadership PAC ($10,000) and the DeVos family ($9,000). Abed’s top contributors have been the Michigan Women Win PAC ($9,015), the Michgian Regional Council of Carpenters PAC ($5,100) and the Michigan Beer & Wine Wholesalers Association PAC ($2,500). The open 101st in Northern Michigan is one of the few districts where the Democratic candidate has a fundraising advantage. Former Rep. Dan Scripps, the Democrat, has raised $106,708 while Mason County Commissioner Curt VanderWall, the Republican, has raised $66,711. VanderWall has given his own campaign $23,482. His other top contributors have been Speaker Pro Tem Tom Leonard’s Michigan Values Leadership PAC ($7,500) and the Michigan Farm Bureau ($2,500). Scripps has given his own campaign $5,179. His other top contributors have been the Michigan Regional Council of Carpenters PAC ($5,000) and the Leelanau County Democratic Committee ($4,000). The West Michigan-based 66th District is an open seat that’s a potential battleground in 2016. Van Buren County Commissioner Beth Griffin, the GOP candidate, has already raised $110,430 — $40,000 of which came from Griffin herself. South Haven School Board member Annie Brown, a Democrat who ran in 2014, has raised $61,503. Griffin has been her campaign’s top contributor. She’s also received $9,000 from the DeVos family and $7,500 from Speaker Pro Tem Tom Leonard’s Michigan Values Leadership PAC. Brown has raised her funds from mostly small donors. Her biggest contributor has been the Michigan Women Win PAC, which gave $2,500. First-term Rep. Brandt Iden (R-Oshtemo Twp.) has already raised $132,455 in this Kalamazoo County-based district. Pastor John Fisher, a Democrat who ran in 2014, has raised $32,663. In 2014, the Iden-Fisher race was the sixth most expensive House race. This cycle, Iden’s top donors have been the Michigan Beer & Wine Wholesalers Association PAC ($10,000), the DeVos family ($9,000) and the Michigan Association of Realtors PAC ($7,100). Fisher’s top donors have been the Ulmer family ($2,500), the Sperry family ($1,500) and Rep. Jon Hoadley’s Azo PAC ($1,000). Union Twp. Trustee Bryan Mielke, a Democrat, ran a $404,000 campaign to try to unseat House Speaker Kevin Cotter (R-Mt. Pleasant) in 2014. Now, with Cotter termed out of the House, Mielke is trying to win an open seat. He’s raised $108,606 so far. Union Twp. Trustee Roger Hauck is the Republican nominee. He’s raised $53,645. 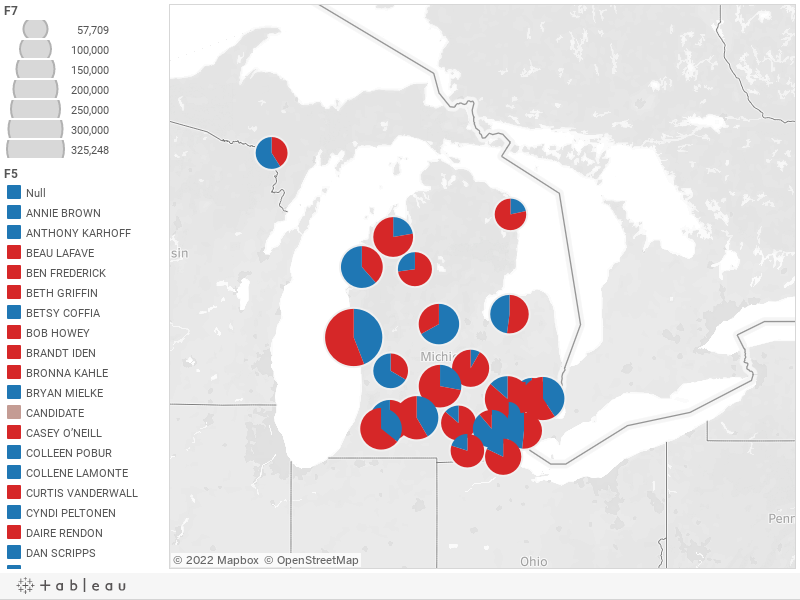 Mielke’s top contributors have been the Operating Engineers Local 324 ($10,000) and Minority Leader Tim Greimel’s Greimel for Michigan PAC ($7,500). Mielke has received $5,000 each from four other PACs. Hauck’s top contributors have been Speaker Pro Tem Tom Leonard’s Michigan Values Leadership PAC ($7,500) and Hauck himself ($5,726). The Grand Traverse County-based 104th District is another rematch of 2014. Rep. Larry Inman (R-Williamsburg), who beat a primary challenger in August, has already raised $122,215. His Democratic opponent is again Betsy Coffia. Coffia has been raising money from small donors. She’s collected $35,092. Inman’s top contributors have been the Michigan Beer & Wine Wholesalers Association ($10,000), the DeVos family ($9,000) and the CMS Energy Employees for Better Government PAC ($3,000). So far, Coffia’s donors have all given less than $1,000. * Revision: An earlier version of this story said there is currently one Democratic-leaning seat vacant. There are actually two: the 28th District and the 11th District.